As the American population has aged, injuries from falls have increased dramatically. The Centers for Disease Control and Prevention estimates that one out of three adults aged 65 and older suffers a fall each year. In 2012, 2.4 million nonfatal falls occurred among the elderly, resulting in direct medical costs topping $30 billion. Falls have become the main cause of injuries to older adults, and are the leading cause of all traumatic brain injuries. Many falls are preventable with good habits and reasonable precautions, such as getting regular exercise, finding alternatives to dizziness-inducing drugs or simply identifying and removing stumble hazards from the home. Researchers have found that many elderly individuals develop patterns of motion that make a fall more likely. Finding a way to detect and report these "precursor" motions to physicians could enable them to intervene in time to prevent a potentially life-threatening accident. But for the technology to be practical, a subject’s movements need to be monitored and reported continuously throughout daily life. Currently, that requires cumbersome equipment that limits researchers’ work to laboratory settings. But all of that could be about to change. Thanks to new developments in wireless body area networks (WBANs), there has been a recent explosion in portable and wearable technology such as Google Glass and smart watches. 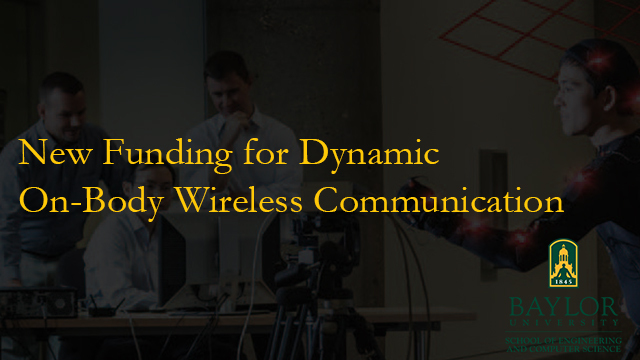 WBANs allow electronic devices to communicate with one another over a highly localized radio frequency network. These can be likened to a Wi-Fi network confined to a particular home or office building, but on the scale of an individual person. WBANs offer the promise of individualized patient monitoring, but even the most efficient systems available now have a problem - battery life. Sensor batteries must be able to operate for weeks or months at a time; currently, however, batteries last only a few days at most. And it seems the tiny antennas used to transmit the sensor’s signals are among the worst power consumers. "Long term, our goal is to implement a power-efficient wearable wireless body sensor network that continually monitors a person’s movements and sends that data to a centralized database where it can be evaluated," says Dr. Yang Li, assistant professor of electrical engineering in Baylor’s School of Engineering and Computer Science and one of the three collaborating researchers on the project. "But our current objective is to design and optimize efficient, wearable sensor antennas that can be worn during regular daily living." Li heads up antenna and sensor development for the project. He has worked with wireless signal transmission in many challenging indoor and outdoor environments ranging from airliners to forests. But this project presents a completely different set of challenges. "Sensor performance is affected simply by the presence of the human body; the signals can be obstructed by body segments as they move," Li says, adding, "And then we have to correlate motion data from the sensors with the actual risk of falling." This will require simultaneously tracking the positions and movements of hands, elbows, arms, legs, knees, feet, even the motion of a subject’s torso. Fortunately mapping movement is right up Dr. Brian Garner’s alley. A Baylor associate professor of mechanical engineering, Garner uses sophisticated motion-capture cameras and software to plot - and then duplicate - the intricate movements of humans, horses and other animals. It’s the same technology that was used to make animated characters like Gollum from The Lord of the Rings and The Hobbit appear more lifelike. But tracking movement is one thing; compiling and transmitting the resulting data is something else again. "Our research relates to understanding how electromagnetic waves behave around the human body and how they are affected by body position and motion," says Garner. "This understanding will guide us in designing more efficient antennas, making it possible for smaller and smaller sensors to operate longer and longer." Though they are engineering faculty colleagues, Li and Garner had not interacted much until they attended an on-campus workshop in 2013. Garner’s biomechanics expertise meshed with Li’s focus on wireless technology and they hit upon the idea of a small, wearable wireless system to monitor human motion. But the two could not seem to settle on a specific application for the technology, and neither had the medical knowledge the project would require. Garner had become acquainted with Dr. Garrison Benton a few years earlier when his daughter had an accident. Benton was the Baylor Scott & White Health orthopedic surgeon who set and splinted her broken arm. He learned that Benton wasn’t only a skilled surgeon, he also held a mechanical engineering degree from Baylor. So Garner and Li reached out to him for input. "We spoke the same engineering language!" Li says of Benton. "He offered the interesting question of evaluating the risk of falling for geriatric patients, and that led us to collaborate on applying wireless sensors to track their motion, to predict their fall risk." Together the three researchers are continuing to refine their design concept. Each brings an individual perspective to their work. As a physician and engineer, Benton foresees a highly portable medical system that capitalizes on some of the technology already developed for wearable devices. "Already we are seeing the emergence of wireless 'on-body' sensors coupled with smartphone technology in ways that will improve our health. Our hope initially is to apply this nonintrusive technology to people at risk of falling. Hopefully we can prevent falls and fall-related injuries, improving their well-being and giving their loved ones some peace of mind," Benton says. Similarly, Li sees an ever-widening array of potential applications for the system. "This technology will find other applications beyond healthcare, anywhere a person’s vital signs, performance, movements or response to extreme environments need to be monitored - firefighters, policemen, members of the armed forces and astronauts, for example. This may very well be the emerging technology today that cellular phones were just a few decades ago." For Garner, the project is more personal. "I lost my grandfather to a heart attack when I was 12; he was just 59. I’m certain that if the medical care we have today had been available to him, he could have lived many more years. I hope this technology will raise current care capabilities to an even higher level by broadening medical oversight that is currently confined to the clinic and lab settings, bringing it into regular, daily life." Article and photos attributed to Baylor Research Magazine.